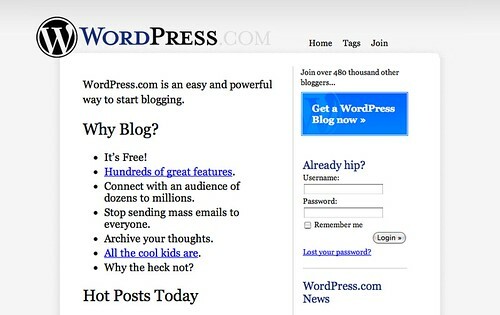 This post is a quick step by step way to set up your WordPress blog. 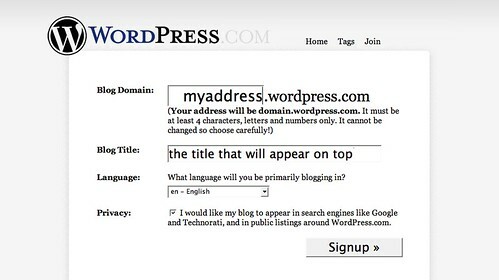 If you are going to create a hosted blog, I encourage everyone to use WordPress not only because their blogs are free but they are simple to use and offer many features. Plus it helps that itÃ¢â‚¬â„¢s similar to what I use for my own site, which means I can help you if you get stuck. On this next page you want to create a username. This is the name you will use to login to Worpdress regularly so you want it to be something simple to remember. Give a real email address and check the box about all the legal stuff. Then click the next button. Then you want to create your blogÃ¢â‚¬â„¢s title. It can be the same as your blogÃ¢â‚¬â„¢s address, but doesn’t have to be. Now youÃ¢â‚¬â„¢ll want to check your email, and once WordPress emails you there will be a link in there that will activate your blog. 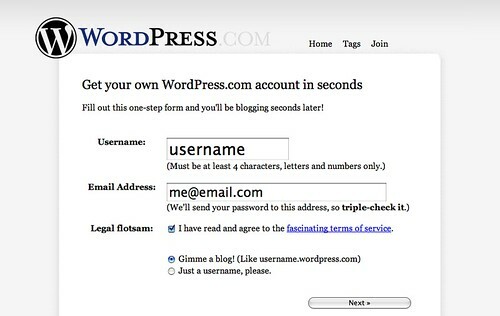 You will need to login using the password they provide you and your username (you can change your password later under the Ã¢â‚¬Å“optionsÃ¢â‚¬Â tab in the WordPress dashboard. On the wordpress dashboard you will see two layers of tabs at the top. The top row is the main menu area, and the row just beneath it, in the darker blue, is the specific options for the main menu tab youÃ¢â‚¬â„¢ve selected. At this point whatÃ¢â‚¬â„¢s most important is the Ã¢â‚¬Å“WriteÃ¢â‚¬Â tab. ThatÃ¢â‚¬â„¢s where you will be create your posts. 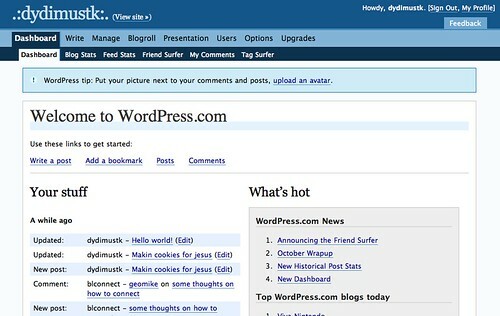 This page is where you create your posts, which are the blog entries. If you want to create a static web page select Ã¢â‚¬Å“write pageÃ¢â‚¬Â. If youÃ¢â‚¬â„¢ll notice you have a title bar – this is like the subject line of an email. You have options for Bold, Italics, Strike through, Bullet points, Numbers, Indentations, alignments, creating and removing links to other websites, adding pictures, creating a line beak for your post, and spell checker. Just below that is the text box. ThatÃ¢â‚¬â„¢s where you do all your typing. WordPress runs automatic saves from time to time, but if you want to save your draft click the Ã¢â‚¬Å“saveÃ¢â‚¬Â button just below the text box. On the right you can create categories for your posts. ItÃ¢â‚¬â„¢s best if you have just a few categories that are broad but that make it easier to search for posts that have been Ã¢â‚¬Å“taggedÃ¢â‚¬Â by that category. For instance if youÃ¢â‚¬â„¢re writing a lot of reflections, that would make a great category. Creating too many categories however, makes them harder to use so create them sparingly. Once your categories are created they are always available in that box to be used for later posts. You always want to double check to make sure your post is live. To do this click on the Ã¢â‚¬Å“View SiteÃ¢â‚¬Â link at the top of your dashboard. This will take you to your blogÃ¢â‚¬â„¢s public persona. It will be important for you to be able to login again once you are ready to write again. You can do this a couple ways. If you are looking for a browser that has a built in blog editor, which I am using for this post, then download Flock (for PC and MAC). Once youÃ¢â‚¬â„¢ve set up a wordpress blog itÃ¢â‚¬â„¢s really easy, and FlockÃ¢â‚¬â„¢s setup wizard will walk you through it, to get moving on it. Just remember to constantly save your posts!